Lino cutting and printing dates back to the early 1900's when artists in Germany used the technique for printing wallpaper. The technique has since developed with some beautiful pieces of art created across the world. Lino cutting involves gouging out the lino with a specialist tool. Everything on the lino which is uncut will be printed in ink so you need to think about your design in advance. Even Picasso has worked in this medium. Think about your design in advance. You can either draw it first onto your piece of lino or just go free hand. Don't forget that everything you gouge out will not be printed in ink. Using the lino cutting tool, gouge out your pattern. It's very important that you cut away from your body and hands as the tool is sharp and could easily slip. Apply some ink to your ink palette and spread it out with the ink roller until it becomes velvety. Use the ink roller to apply the ink to the lino, ensuring an even coverage. Press the lino onto a piece of paper, card or whatever you want to print. Apply pressure all over the piece of lino. If you have a spare clean ink roller, this is ideal to run over the lino to make sure that everything has been pressed down. Carefully lift up the lino to reveal your pattern. If some areas don't seem to have been cut deep enough or you want to add more detail, you can easily do this. However, once removed, the lino can't be replaced. You can experiment with different colours of ink or backgrounds or even let your first print dry and then add another lino cut in a different colour over the top. 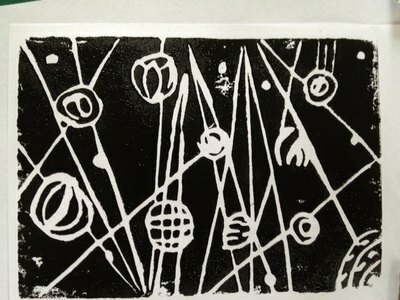 A basic lino cutting set is not expensive if you want to have a go. I purchased mine from Handprinted for £18 which included everything I needed to get me going. The great thing about your cut lino is that you can use it again and again. I've already used my design to make cards and to jazz up a paper bag.